Twelve South, makers of excellent Mac and iOS device accessories, have announced today the latest product in their family of accessories for the iPhone: the SurfacePad. Made of Napa leather and weighing less than an ounce, the SurfacePad is a modern, minimal design that beautifully complements the stylish design of iPhone. What makes SurfacePad special is what it’s not: a military-style rubber grenade for your iPhone. SurfacePad is an ultra-thin, luxury leather cover that shields iPhone 5 or 4/4S from the more typical hazards of life, like the change in your pocket, jump drive in your backpack or the nail file in your purse. It allows you to set your iPhone down on rough spots like a concrete bench or stone tabletop without worrying about scratching the sleek surface of your iPhone. Check out more photos of the SurfacePad here, and a video below. The SurfacePad resembles an iPad Smart Cover with its small size and subtle design. Many people have wondered why Apple hadn't made one themselves; so the team behind Twelve South decided to make their own. 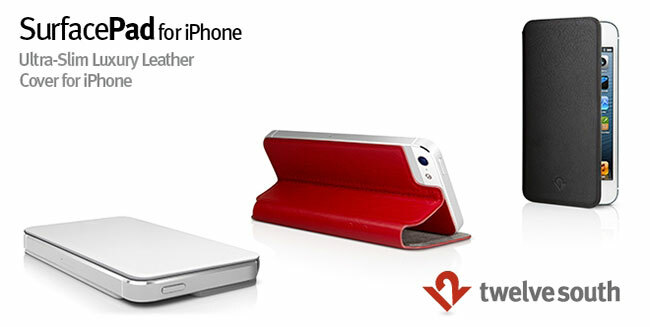 They have one for the iPhone 4/4S and the iPhone 5 with 3 colors: modern white, jet black and pop red. The SurfacePad also doubles as a stand and has a microfiber lining that protects the glass screen on your iPhone. The volume buttons are easily accessible when open as well. The outside of the case also has some markings for the volume button location when the case is closed. There are many iPhone owners who wouldn’t be caught dead with their iPhone in a thick, oversized plastic case,” said Andrew Green, Creative Director of Twelve South. “So, just as we did with BookBook for iPhone, we’re inventing a whole new category of covers. SurfacePad is a gorgeous layer of luxury leather that shields and enhances the look and feel of iPhone. 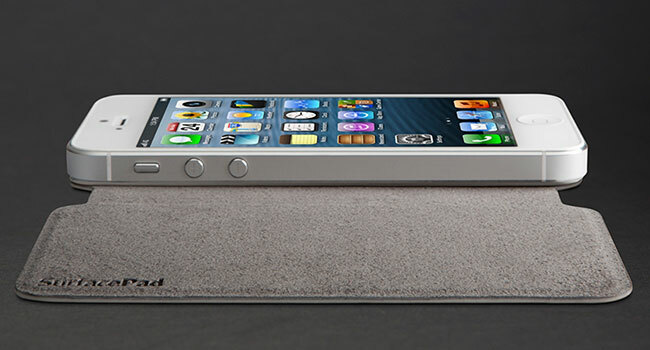 With SurfacePad covering iPhone, there’s still no doubt you’re holding an iPhone. Just don’t call it a case... call it a SurfacePad. The back of the case is trimmed out on the corner to leave the camera open for easy photography. The feather light cover is less than 1/10th of an inch (1.7mm) thick and weighs less than one ounce (25 grams). It's available now for $34.99 directly from the Twelve South site. Look for a more detailed evaluation of the SurfacePad as I will be reviewing it myself next week; until then, watch the promotional video below. Vector & pixel trafficker for Seymour Midwest LLC, regular MacStories contributor, Hip-Hop junkie all day long; Apple addict circa 1976.